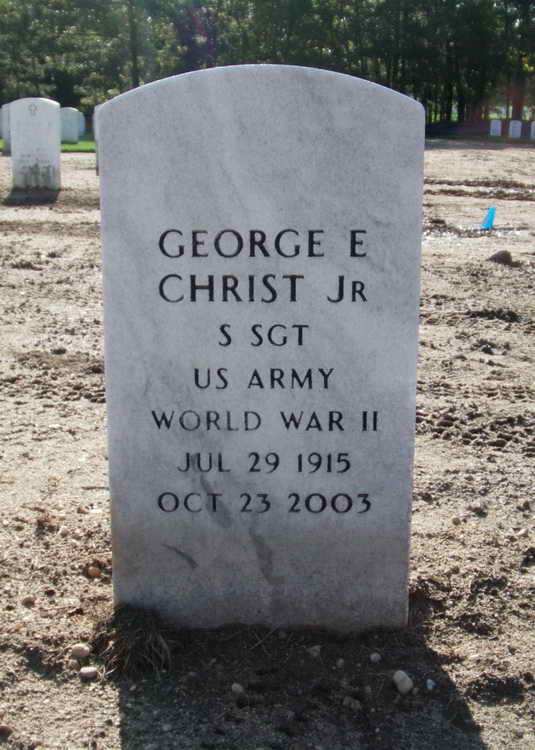 Grave marker for George E. Christ, Jr. in Plot: 24A, 1961 of the Calverton National Cemetery, Calverton (Suffolk), New York. George enlisted in the Army on 16 June 1941 at Ft Jay, Governors Island, NY. When he volunteered for parachutist duty he was assigned to the 507th PIR and went through training at Ft. Benning, GA.
On 16 October 1942, T/4 Christ was one of the men transferred to the fledgling 508th PIR as Cadre. He was assigned to the Hq 2nd. In the next four months he was promoted to Staff Sergeant and held that rank throughout the war. SSgt Christ was awarded the Bronze Service Arrowhead device for his participation in Normandy assault.